Produktinformationen "GAME OF THRONES DAENERYS TARGARYEN 1/6 SCALE ACTIONFIGUR - Beschädigte Verpackung"
From Three A. This stunning 1/6-scale figure of Daenerys Targaryen from Game of Thrones features a highly-accurate realistic likeness of the character's appearance in the television series and stands about 10 1/4" tall. Daenerys is fully articulated with a soft PVC dermis on the arms and torso as well as real cloth clothing and rooted hair for an authentic look and feel. 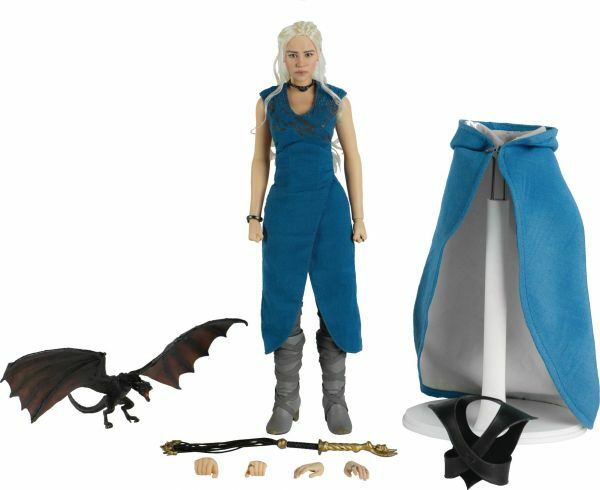 Daenerys comes with 3 sets of changeable hands and accessories like Kraznys' Whip and a finely detailed resin dragon figure. Add her to your collection today. Weiterführende Links zu "GAME OF THRONES DAENERYS TARGARYEN 1/6 SCALE ACTIONFIGUR - Beschädigte Verpackung"
Kundenbewertungen für "GAME OF THRONES DAENERYS TARGARYEN 1/6 SCALE ACTIONFIGUR - Beschädigte Verpackung"